I'm a big fan of the Harry Potter universe. I remember when I first read the first book how much I loved it, and 11 years later I'm still enjoying these characters so much! I was lucky to visit The Wizardly World of Harry Potter a few days ago at Orlando and it was amazing! I can't even describe my excitement and how incredible it was to be there. Even mi fiancé, who haven't read the books, was impressed. 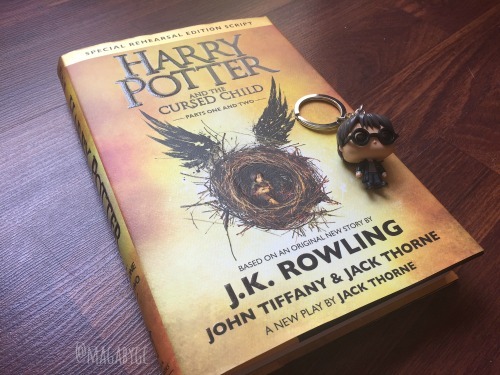 Anyway, I couldn't buy the new book, Harry Potter and The Cursed Child on the realease day, but I guess everything happens for a reason beacuse when I finally could buy it it was on sale! So I waited until my flight back home to relax and read it. Let me tell you, I was feeling very nostalgic to be reading again my favorite characters but also I was expecting more. First of all, I hate reading scripts. One of the things I like more of these book series are the descriptions, so I wasn't happy reading a script. I knew that before reading it, so i wasn't surprised...just kind of angry with the author. Why waste a perfect and interesting story doing a play? Maybe that's a bit harsh, but I'm not a fan of theater either and most important, I don't think I'll be going to London anytime soon... so I had to settle with the script. I was happy to know more about their adult life, but I feel that there was so much more!. I understand that it's time to follow the young generation, but I didn't fall in love with them. Maybe I needed more words to like them, but also I felt that this new friendship was kind of forced and too good to be true. Also, many times, specially at the climax, I felt like I was reading a fan-fiction... I mean, seriuosly?? I'm no big on reading scripts either but as this is an addition to the HP universe, I have to get it. HAVE TO. I actually love theater and reading playscripts, so it worked for me. I think it's meant to seen live. This playscript is for those that want the story and can't see the play, but I was able to see it when I went to London last month and it's just amazing. I do hope they'll film the play for everyone to see. I'm hoping for that too! I've heard the play is amazing. I was kind of surprised she chose the screenplay format, too. Maybe its because she was working with someone else. I agree with Lauren. I hope they make it into a film, too. I like seeing plays, but am not a fan of reading scripts. Like you, I love the description and details included in the HP series- so I really missed it here. I didn't feel like the story was developed as much as I wanted it to be because of the format. I didn't love the book, but I would see the play if given the chance because I think it is sure to better.